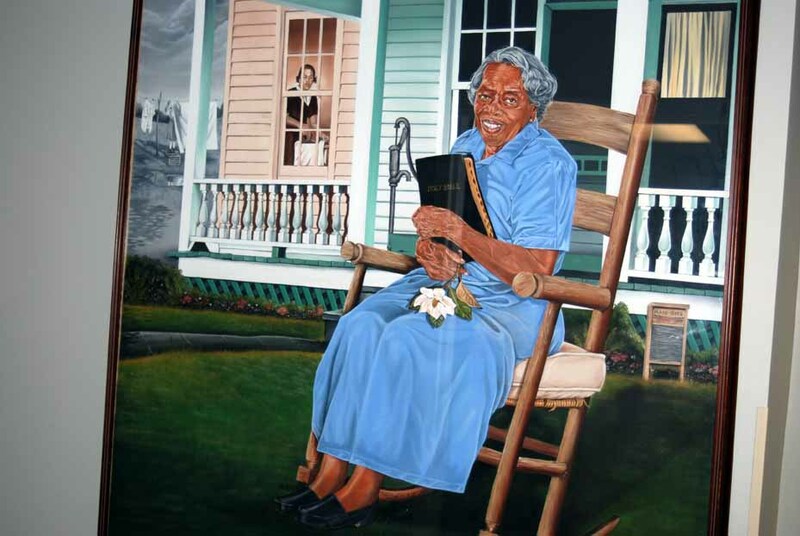 This colorful portrait of Miss Oseola McCarty is on a wall in the lobby of McCarty Hall, 103 Eagle Walk Drive, the University of Southern Mississippi Hattiesburg. OSEOLA McCARTY HALL, Hattiesburg, Mississippi — Circulating on the campus of Southern Miss on a day in July, just having come from lunch at the Shoney’s on U.S. 49, then being here on Eagle Walk Drive, seeing Oseola McCarty Hall was certain to stir memories that tugged at heartstrings just as patriotically as did the witness of heroic acts in the African American Military History Museum. The name Oseola McCarty is a trumpet blast, sounding a mostly inexplicable humanity that questions and is seemingly at odds with the reality of living in a covetously material society. The story of Oseola McCarty, the humble washerwoman who lived a life of material self-denial, begs to defer extraordinarily out of that normal existence. Oseola McCarty, most of the world knew at the moment of disclosure, gave “The Gift” for scholarships to the University of Southern Mississippi. Given the circumstances of her normal life as a washerwoman, her $150,000 gift to Southern Miss is to be considered a staggering amount. The significance of Oseola McCarty’s benevolence continues to resonate as an act of goodwill and will do so infinitum, long after the gift was made public on June 26, 1995, long after her passing on September 26, 1999, and as long as there is Hattiesburg and as long as there is a university. Southern Miss has devotedly kept alive memory of “the humble washerwoman who became The University of Southern Mississippi’s most famous benefactor.” That devotion is reflected in the entire university community, especially the student body and the USM Foundation. Oseola McCarty’s name easily blends in with traditions here on the campus of Southern Miss, as if without interruption for the century of the university’s existence. The historic football game day parade, what the faithful here call the Eagle Walk, begins two-and-a-half hours before every kickoff. Thousands of fans line the sidewalk, including in front of 103 Eagle Walk Drive. Action initiated by the Student Government Association led to a new residence hall, then in the planning stages, to be named “Oseola McCarty Hall.” Nowadays the 382-bed dormitory, at 103 Eagle Walk Drive, houses upper-class male students, including Honors College and athletes. Inside the residence hall, on lobby walls, there is framed oil painting of Miss McCarty and a pencil drawing. McCarty Hall opened in 2001. In regards to athletes, Southern Miss, for sure, is ripe for name dropping, especially when it comes to citing names of former star football players whose images are featured on banners under the end zone section at The Rock. Brett Favre, perhaps, is the most famous of them all. He starred here four seasons at quarterback. He went on to lead the Green Bay Packers, amid an All-Pro and league MVP career, to victory in Super Bowl XXXI in January 1997. Other Golden Eagles on hall of fame banners outside The Rock, among others, are punter Ray Guy, defensive back Patrick Surtain, cornerback Hanford Dixon, wide receiver and return specialist Louis Lipps, quarterback Reggie Collier, center Amos Fowler and defensive tackle Jerald Baylis, who starred in the Canadian Football League. “Oseola McCarty’s lined, brown hands, now gnarled with arthritis, bear mute testimony to a lifetime spent washing and ironing other people’s clothes. Less evident is how this quiet, 87-year-old black woman came to donate $150,000 to The University of Southern Mississippi. “Hattiesburg laundry woman Oseola McCarty boarded a train here Thursday for a trip to Washington, where she was to be honored by President Bill Clinton and the Congressional Black Caucus. “The 87-year-old woman — whose $150,000 donation to The University of Southern Mississippi from her life’s savings has sparked national attention during the past month — boarded the north-bound Amtrak about 9:20 a.m. for the 24-hour journey. Miss McCarty, who declined an invitation to go by plane, was accompanied by Mary McCarty, a 50-year-old cousin from Shubuta and a high school social studies teacher in Waynesboro. “‘I'm just tickled to death,’” McCarty said while waiting at the Hattiesburg train station, noting it was her first trip out of the South since a visit to Niagara Falls more than 50 years ago. Reportedly, contributions to the scholarship fund exceeded $200,000. Stephanie Bullock, a senior at Hattiesburg High School, was named as the first McCarty Scholarship recipient. She went on to earn a Master of Business Administration degree. At last check, there have been 28 McCarty recipients. Media coverage of “The Gift” and the washerwoman who gave it ran the gamut from all the major networks, Ebony and Jet, the New York Times, to name but a few. “People in Hattiesburg call her donation the ‘Gift,’” Pulitzer Prize-winning New York Times correspondent Rick Bragg wrote after interviewing Miss McCarty in August 1995. “She made it, in part, in anticipation of her death. As she sat in her warm, dark living room, she talked of that death matter-of-factly, the same way she talked about the possibility of an afternoon thundershower. Miss McCarty died on September 26, 1999 at age 91. Southern Miss responded by inviting people via email to tell how Oseola McCarty had been an inspiration. Teachers, including Adele Berardi of Southern Regional High School in Manahawkin, New Jersey, used Miss McCarty’s generosity as a teaching moment. “Many had a difficult time dealing with her generosity,” Berardi said in an email. “Violence, drugs and anger are much easier for these children to understand, but true selflessness can be such a foreign concept to them. The Oseola McCarty Scholarship Fund is located at The University of Southern Mississippi, 118 College Drive, #10026, Hattiesburg, Miss. 39406-0026. 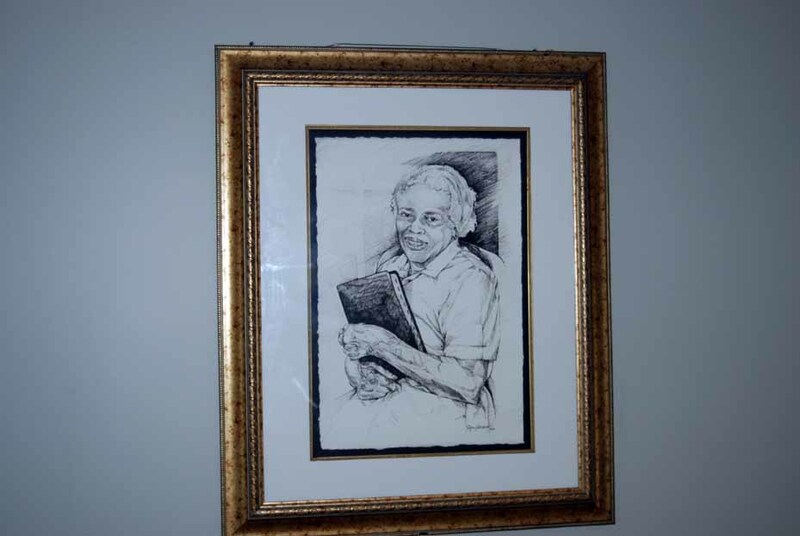 Miss Oseola McCarty, Southern Miss’ most famous benefactor, is featured in this pencil drawing on a wall in the lobby of McCarty Hall, 103 Eagle Walk Drive.